In the middle of a September night before going to see the new "It" movie with a few friends, I awoke in a panic. My brain had just taken me through a short film of its own, in which everywhere I went, there was a man in a ragged bunny costume ominously standing in the distance, waiving to me in a taunting manner before running out of sight. Each time before he appeared, a small stuffed bunny would be found nearby. Just before springing awake, I dreamt was sitting in my basement, only to turn around and see him peering through a small horizontal window. It was like "Donnie Darko" meets Pennywise. It scared the bejeezus out of me, and I still feel goose bumps recounting the dream. "Some people do have very vivid dreams; when they describe it, it's like they're describing a scene from a movie," said Dr. Charles Bae, a sleep medicine neurologist and associate professor at the University of Pennsylvania. "It can be very stressful; that’s why people don't like them. They're anxious, afraid, they feel threatened." Why I got the nightmare, however, seemed pretty simple: Some nervous anticipation about watching a creepy clown terrorize children acted as a trigger, right? "If you kind of plot out a timeline, they had some sort of physical or sexual trauma or very stressful events in their lives. This Las Vegas shooting, that could be a trigger for some." After fielding this question, Bae wanted to know if I generally enjoy horror movies. I don't. "Yes," Bae said of my assessment. "If you were truly (thinking), 'God, I really don’t want to (see it) but I'll do it anyway.'" When trying to determine exactly why someone has a certain nightmare, it's usually difficult to draw a line saying "A led to B," according to Bae. But generally, nightmares are at least loosely linked to something the person is experiencing or stressing about during waking hours. "It's not pleasant," Bae said. "Usually they involve some sort of stressor to the person involved or someone they know." Nightmares, like any dream, occur during REM (rapid eye movement) sleep: the deep, cyclic sleep during which your body and brain recharge. The dreams you're most likely to remember are the ones closest to when you're waking up, during your last REM cycle, and you're also more likely to be able to recall the details the longer the dream lasts. Of course, if you keep having the same dream over and over, it's a safe bet you'll remember those. Bae recalled a recurring nightmare from his childhood: A witch lived under his kitchen refrigerator, and if anyone got too close, she'd grab them and trap them in her lair. Again, there is not always a direct link between life events and a recurring nightmare, Bae said, but many times it appears to be the case. "If you kind of plot out a timeline, they had some sort of physical or sexual trauma or very stressful events in their lives," Bae said. "This Las Vegas shooting, that could be a trigger for some." Nightmares aren't abnormal, but for some, the high frequency of these terrifying dreams can cause serious sleep troubles. So, is there a way to "treat" nightmares? Obviously, there's no magic bad-dream pill, but there are a number of things you can check to try and curb regular nightmares. For a number of prescribed medications, like some beta blockers, nightmares are a common side effect. Bae said he's heard of people trying to quit smoking using Chantix, only to nix the drug because the nightmares got so bad. Adjustments in doses of certain medications can also affect your dreams. Withdrawal from substances like alcohol can have similar effects. Bae also stressed that if you've never been treated for anxiety or depression, but believe your frequent bad dreams may be tied to a possibly undiagnosed disorder, you should see a doctor. Yet the easiest potential remedy is fixing a problem that plagues a third of all Americans: Get some more damn sleep. "No one is getting enough sleep," Bae said. He explained when you're sleep deprived, your body starts missing out on that valuable REM sleep, which can set yourself up for overloading your brain when you finally do get enough sleep. Let's say you string together a couple of all-nighters for work or school or stay up into the wee hours of the weekend partying; then, Bae said, "you crash, and the percentage of REM sleep is really high. That might be the time where you might have more dreams and, therefore, nightmares." During normal sleep, about 25 percent is REM. But during this "recovery" sleep, it can be as high as 45 percent. I'll admit my sleep schedule could be more consistent, and I probably skim one or two necessary hours off most nights in favor of Netflix. 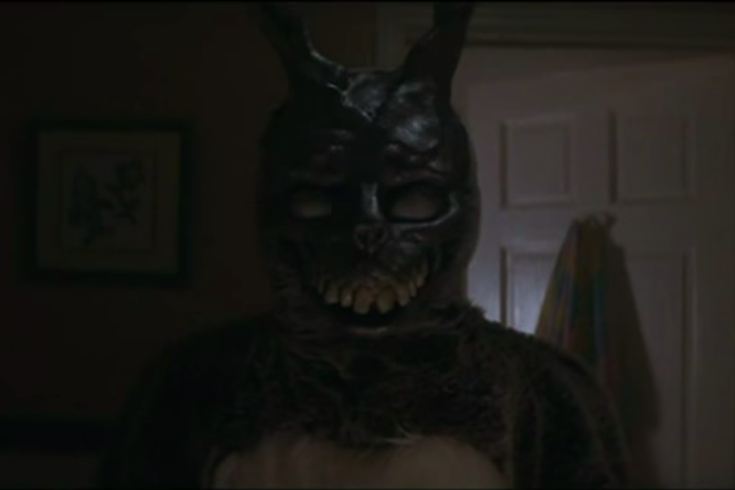 Luckily, though, the bunny that stalked me one night last month hasn't returned since I saw the movie. "I guess it's good you didn't have any nightmares afterward," Bae said. I couldn't agree more.